Celeb Youth » Do we have an English version of The American Dream? We have been cognitively dissonant from the beginning. European settlers set about driving the Native American populations to the west, setting in motion a tragic chain of events that culminated in the Trail of Tears in the middle of the 19th century. In 1619, meanwhile, a Dutch man-of-war brought African slaves to Virginia. And so while white settlers built and dreamed, people of color were subjugated and exploited by a rising nation that prided itself on the expansion of liberty. Despite this, America’s foundation through a war of independence, and the creation of a constitution that enshrined rights to life, liberty and, not happiness, but the pursuit of happiness, gave it a different national identity than England during the same period and carry a different symbolism into the present. Our image of 19th century England is of a country at the centre of brutal capitalism and imperialism, with an entrenched class system. The country has never had s written constitution. But whatever the origins of The American Dream, as I suggest below, England and the US have converged through the twentieth century. In the US, ‘the myth of the West was the myth of the nation: that all of us could light out for the Territory and build new, prosperous lives’. The economic crash of 1929, followed by the Great Depression, both disrupted it and reaffirmed it. As all that was solid melted into air, people were plunged into desperate poverty. They lost savings, jobs and all sense of opportunity, possibility and hope. Hope came back through Franklin D. Roosevelt’s New Deal. Between 1933 and 1939, Roosevelt’s programme focused not just on short-term relief but on long-term investment. A new Social Security System provide an economic safety net for millions and financial regulation brought decades of economic stability. There was a programme of investment not just in infrastructure but also in arts and culture. After the second world war, as soldiers returned, the 1944 GI Bill offered them discounted mortgages, low-interest business loans, and tuition-free higher education with maintenance grants. 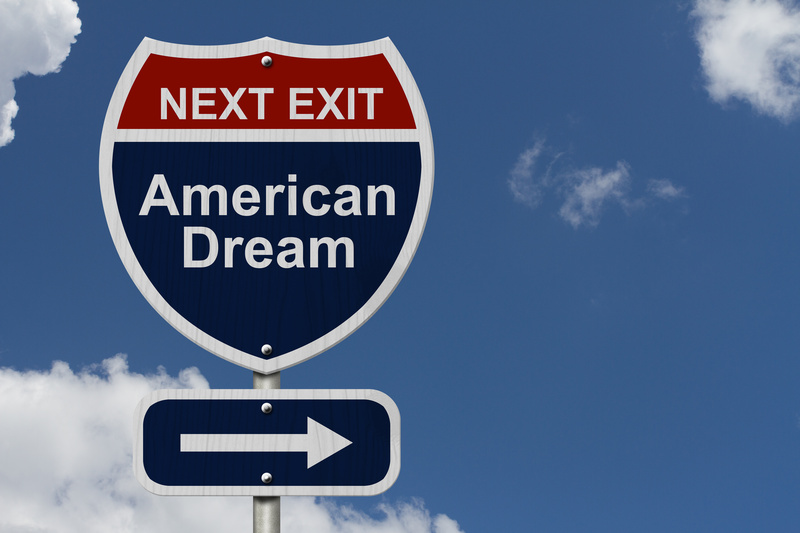 When the Civil Rights Movement secured legislative victories in the 1960s it seemed to many that The American Dream was a reality. In the UK, the landslide election of a Labour Government in 1945 paralleled shifts in the US, as those who had made wartime sacrifices, demanded a greater share of the nation’s resources. Incoming Labour Prime Minister Clement Attlee led a government that invested in housing and education, and created the welfare state, the British equivalent of social security. Their stand-out achievement, one which eluded the US, was the National Health Service. It was once these changes were established that the idea of meritocracy emerged. Jo Littler, who has tracked meritocracy through shifts in policy, locates is first usage in 1956 by Alan Fox. He was critical of the idea from the left, writing: ‘Merely to devise bigger and better “sieves” to help the clever boys get to the top and then pile rewards on them when they get there is the vision of a certain brand of New Conservatism; it has never been the vision of socialism’. However, the idea that hard work is rewarded has become increasingly central to UK policy and to the popular imagination. It bears a close resemblance to The American Dream. In 1979 in the UK, Margaret Thatcher’s Conservative Party took power. In 1980 in the US, Republican Ronald Reagan was elected as President. Both leaders were initially disliked within their own parties but later became iconic. They began to dismantle the elaborate structures of social support established during the 1930s, 40s and 50s. They were ideologically committed to the free market, expanding its territory into the public sector, selling off as much of their nation’s resources as they could, passing anti-union legislation and cutting both welfare benefits for the poor and taxes for the rich. As manufacturing industry declined, the increasingly-deregulated financial sector grew. The conditions for the 2008 financial crash were in place but before that we had changes of government. The Democratic Party in the US and the Labour Party in the UK have traditionally represented workers. But under Bill Clinton and Tony Blair, the New Democrats and New Labour respectively bought into neoliberalism, failing to reverse any of the measures brought in by Thatcher and Reagan and seeking to find a ‘third way’ between right and left by harnessing the resources, strategies and talent of the private sector in the service of the public sector. Labour did many progressive things, for example, reducing poverty and bringing in a minimum wage, but did next-to-nothing to regulate the financial sector and less-than-nothing to strengthen Trade Unions. Clinton was less progressive. He gutted welfare and criminalised a generation of African American men. As Michelle Alexander wrote in The Nation earlier this year, Hillary Clinton, who actively backed her husband, does not deserve the black vote. Whilst Thatcherism worked in multiple ways to secure consent for its politics, one of the most important was its meritocratic appeal to consumerism as a general mode of participation in public life which invited people to identify with the notion of themselves as consumers rather than as workers or citizens in a range of public settings. The presentation of acquisitive consumerism as the route to empowerment in any social context was closely bound up with the implicit assumption that the accumulation of consumer goods was at once a sign of merit and its tangible reward. In the UK, people were encouraged to purchase shares in the newly-privatised industries and to buy their discounted council house, without worrying where the next generation would live. In the US, home ownership was supported by cheap borrowing and people planning for retirement were encouraged to invest in individualised 401(k) accounts to supplement collectivised social security. In both countries, the new century brought drops in social mobility and finally a financial crash and vast bank bailouts. The resulting high levels of youth unemployment mean that young people must now go to university to have any viable hope of a job. The cuts to the public sector in the name of austerity, mean that they emerge from university with debts most will never repay and with little hope of being able to afford a home of their own. In Britain the powerful language of aspiration, social mobility and opportunity for all to rise through the social structure has not become muted, despite a double-dip recession, still growing inequality, and a historically unprecedented drop in living standards for the working majority. On the contrary: it has escalated. It is this combination of meritocratic feeling and brutal economic inequality that we are calling Austere Meritocracy in the book we’ve currently writing about our research. The American Dream, or the English version of it, are vital to dampening criticism of the underlying political structures that support inequality. The fantasy that hard work is rewarded can be read as a form of what Lauren Berlant calls cruel optimism: part of an attachment to objects whose realisation is impossible within ‘compromised conditions of possibility’ . Young people’s investment in hard work reflects the ‘centrality of optimistic fantasy to reproducing and surviving in zones of compromised ordinariness’. We are hopeful that the support, particularly among young people, for Corbyn and Sanders, mark the beginning of a political revolution that can reveal the ideological workings of our meritocratic dreams.